I finally received my Indiegogo purchase. Let's review the crazybaby Air Wireless Earbuds after my first week. Every developer needs a good pair of quality headphones or earbuds to keep distractions to a minimum while converting their conscious stream of thought into code. Whether it's Coffitivity, ambient sounds (like Noisli), white noise (like A Soft Murmur), or even the communities popular .NET Rocks! host Carl Franklin's Music To Code By, you need a trigger to send you into a productive code frenzy. I backed the campaign back in November of 2016 ($100) and I just received the product in the mail about a week ago. 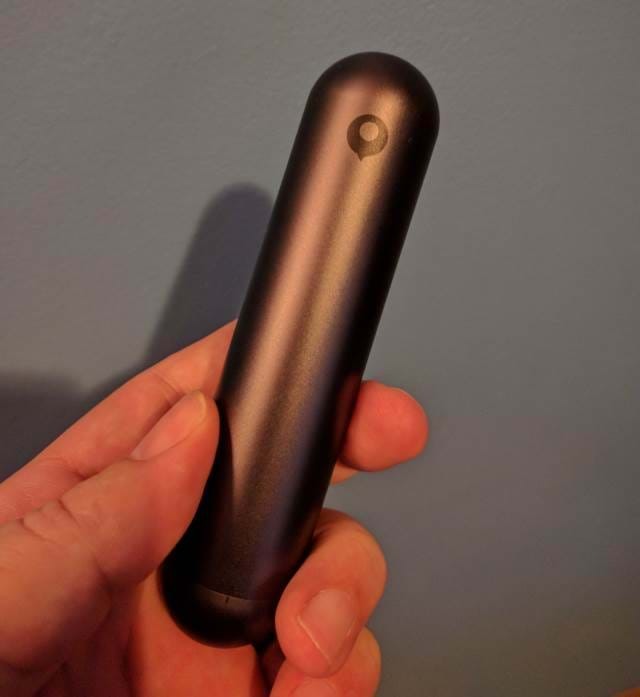 Now, with this product in my hands for a little over a week, I've been using Air every day and wanted to give my feedback on this product. I have to admit the packaging and presentation of Air is stylish and trendy. crazybaby's Air is packaged in a white box and, at first glance, contains the capsule holding the earbuds. Air ear buds are available in either black or white (I chose black) with the capsule matching your color choice. The package contains the capsule with ear buds, a quick-start guide, additional silicone ear tips and sport-sleeves which include small, medium, and large sizes, a VERY short USB cable for charging, and a way for you to attach your earbuds to what is called an "Air-leash" for when you're afraid the Air ear buds could potentially fall out. In the quick start guide, it mentioned turning it to the filled circle position and then open the capsule by pulling and exposing the earbuds. When I first opened the capsule, it was in the open circle position and I opened the capsule with no problem. Is it supposed to be a open/closed mechanism? If so, why can it be "closed" and I can still open the capsule? Since this is using a USB-C charger, it usually takes a matter of 20-30 minutes to get a full charge. Based on my experiences with Air, the wireless ear buds lasted a total of 2-to-2.5 hours at a time before I noticed some audio dropping off. I thought they needed charged since I was constantly using them. I haven't done a proper test over the past week to drain the heck out of the ear buds, but I will continue to test their limits and post my results here. To charge the device, plug the USB-C device into a USB port. On the other end, you'll notice a small LED light. Orange means it's charging, Green means it's charged. I've been extremely happy with the product so far in regards to how quickly it charges. Keep in mind, I've used them in various situations such as working out (treadmill), programming, virtual reality usage (Air paired with phone in a VR headset), and car use. The crazybaby Air wireless earbuds are Bluetooth 4.2-compatible and, because of Bluetooth specifications, it works within 30 feet of the paired device. As I mentioned above, I paired the Air to my Google Nexus 6P and it works exceptional while listening to audio books and music. Pairing the device took me a little while to figure out. After reading the quick start guide, it said to click the button to pair it. I've been using Bluetooth for quite some time, so I've clicked and held the button on each earbud until both lights were flashing. Once that occurred, I was able to pair the earbuds with my device. There were a couple times when the right ear bud would cut out on me and come back. After a full charge and a fresh "pairing," everything seemed to work ok. The Air ear buds are also water/sweat proof with a water-resistant rating of IPX6. I'm not saying you can go swimming with them, but this was another reason I went with crazybaby Air earbuds. They've even included microphones on each ear bud. 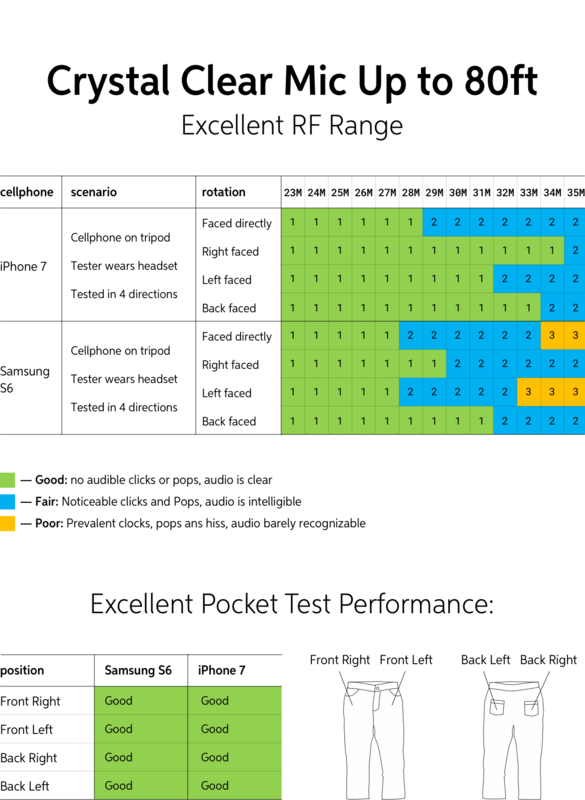 While I haven't used the Mic yet, it's interesting to see their RF range chart explaining their results on how well the Mic functioned in different situations. I love the intuitiveness and design of the buttons on the Air for specific functions. There are sometimes when I forget I have them in because they are also so ergonomic and comfortable. Over the past week, I've been extremely happy with the product. 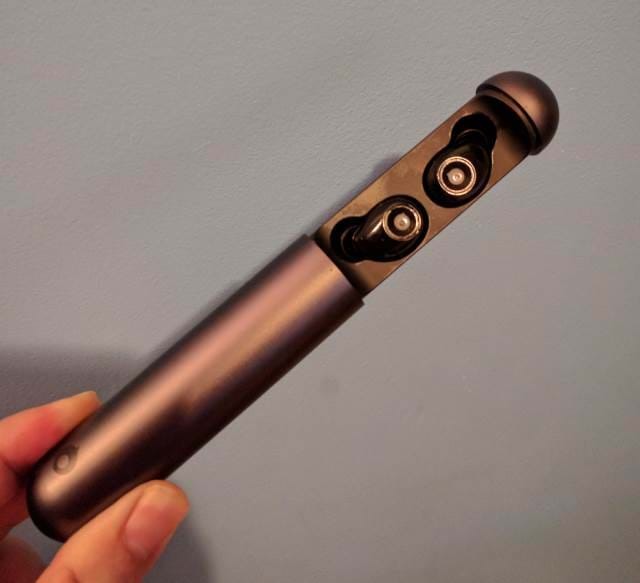 While I can't compare the Air to other wireless ear buds (like the Apple Airpods vs. crazybaby Air review), I feel this was an excellent purchase and I can truly say that I now have a standard of what to compare other wireless earbuds to. The crazybaby Air wireless earbuds are what I consider the new standard for wireless audio. The Indiegogo campaign is finished, but they do they have their website up and running. Did you buy these awesome ear buds? Post your comments below and let's discuss.